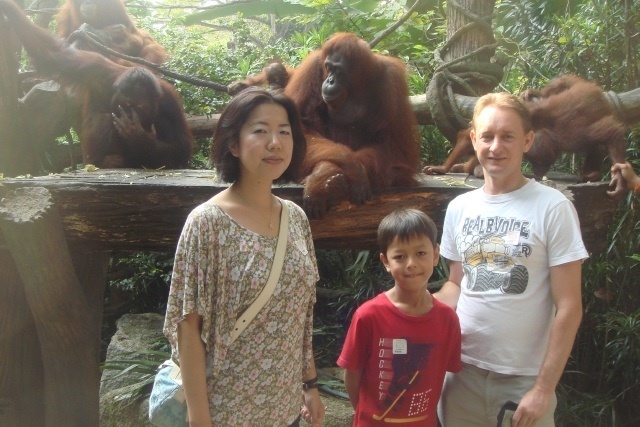 When we were in Singapore, the place my son wanted to go most of all was to the Singapore zoo. It’s an amazing zoo and deserves its reputation as one of the best zoos in the world if not the best. It is a zoo everyone can enjoy, not only families. The zoo gives you an opportunity to get up close to the animals without having to peer through steel bars. The zoo has given away to bars by holding them in enclosures that best represent their natural habitat. 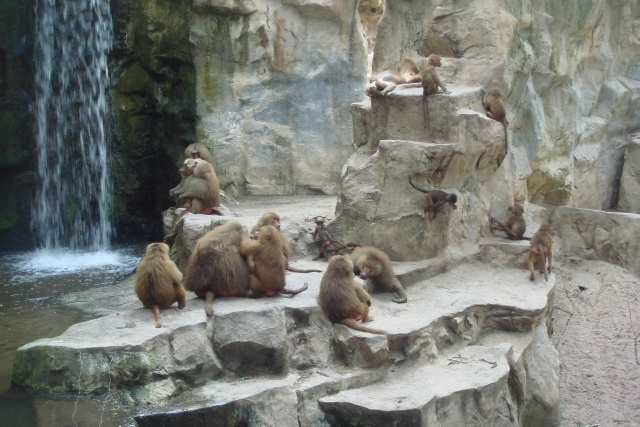 Most of the animals are kept in their enclosures by moats or steep embankments. 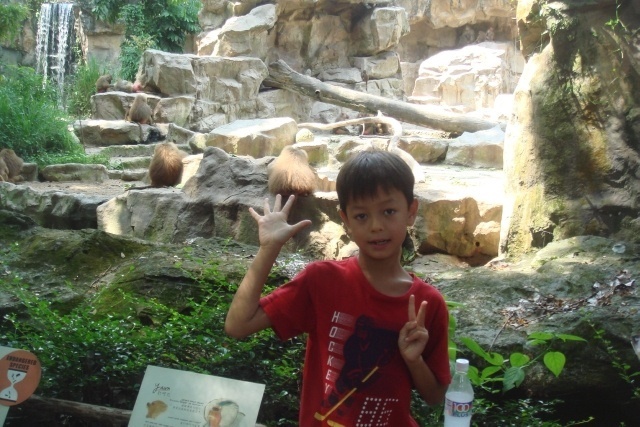 Today I thought my son Rei would share with us what he thought were the highlights of the zoo. 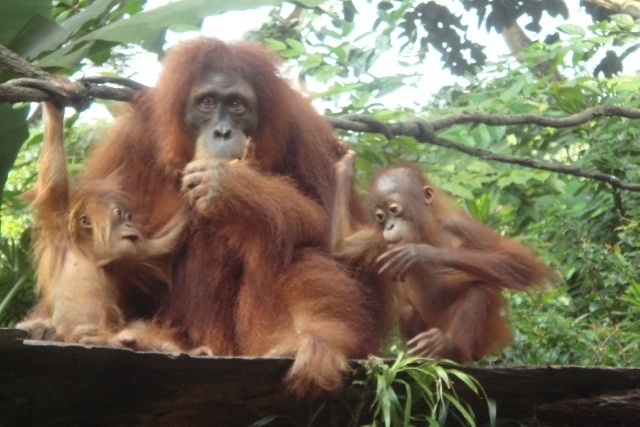 No surprise here, like most people who have had breakfast with the orangutans it rates highly on their visit. 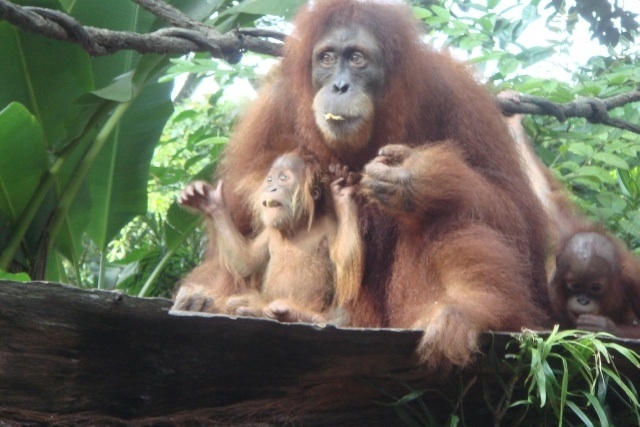 It is a unique experience watching the orangutans come over for breakfast swinging on the ropes over the open zoo to the platform where they nibble on a variety of food. They were so adorable with their big round eyes, shaggy fury orange coats. They even brought over two babies who clang to their mothers before they felt comfortable enough to play with one another. The food that we ate too was surprisingly good similar to what you would eat at a hotel. We were lucky, we could sit and enjoy our breakfast with the front row seats to all the action. This enclosure is so exciting, there were flying foxes soaring above the treeline canopy. Fruit bats were hanging upside down from trees, the beautiful but awfully slow sloth took an eternity to move and there were also two very young ring tailed lemurs exploring their new habitat which we didn’t see until one jumped centimetres over our heads which made me let out a scream. 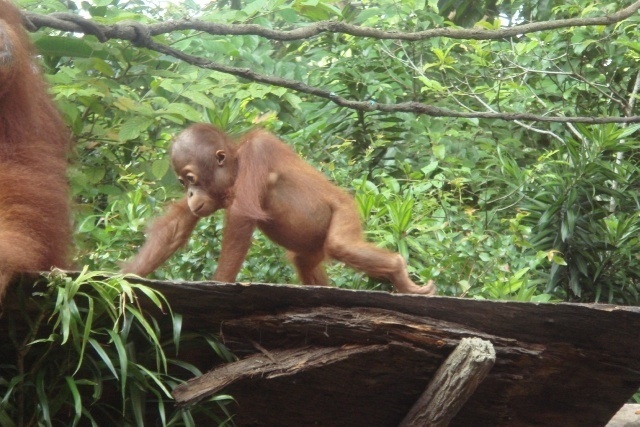 The keeper told us they are adjusting to their new environment and have just started exploring by themselves. 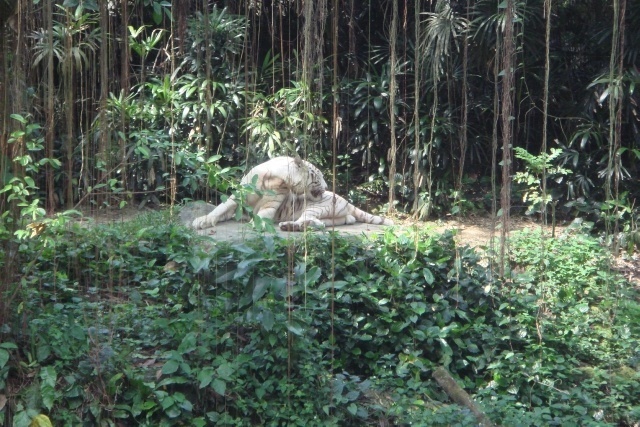 The Singapore zoo has two white tigers named Omar and Winnie. Winnie was sound asleep, stretched out on top of a log while Omar stood in the background. These animals are a popular attraction as they are quite rare to see in zoos. People come to observe their creamy white fur covered in black stripes, their piercing icy blue eyes and their little pink noses and if your lucky enough you might be able to catch them having a swim in the moat. They are one of a few feline that like swimming. The baboons in the Great Rift Valley of Ethiopia Zone has a colony of over ninety baboons sitting in a dry, rocky desert landscape. It’s fascinating to watch the clans engage in their social activities, with the Alpha Males protecting their territory and other monkeys grooming one another. Here comes the surprise, not an animal in sight but great fun letting the children escape from the stifling heat. The children can play about in the water, shoot giant water guns but the place they have the most fum is waiting under the jumbo water bucket to fill with water before tipping over and pouring down on them. 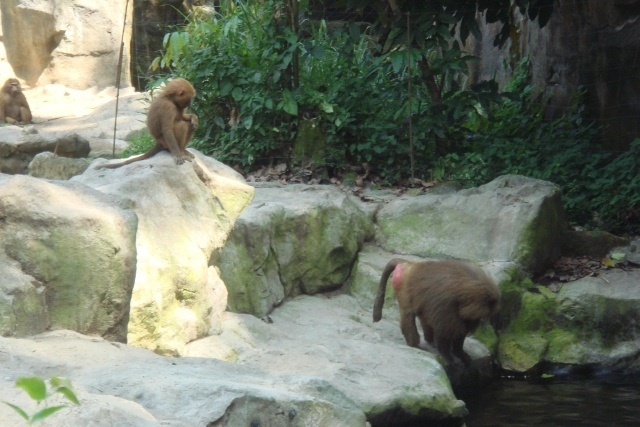 These are just a few of the highlights of the Singapore zoo. There is so much more for you or for your family to enjoy. Make sure you visit when you come to Singapore. 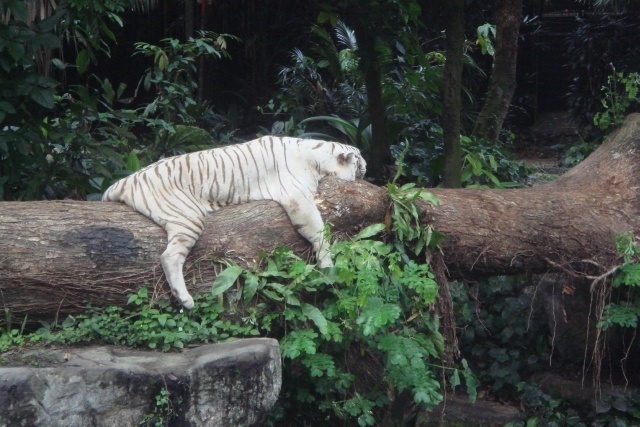 Have you been to the Singapore Zoo? What did you think were the zoo’s highlights? Singapore kind of caught me by surprise I had been expecting it to be hilly, slightly mountainous terrain similar to Hong Kong but from the window of the taxi I saw that it was flat. Like Hong Kong though the country still has plenty of land. Hong Kong’s is mainly due to its hilly terrain that makes it unable to build upon while Singapore has pockets of forest, green lush trees which have been left there to grow their natural way. I could see why Singapore is known for its gardens. 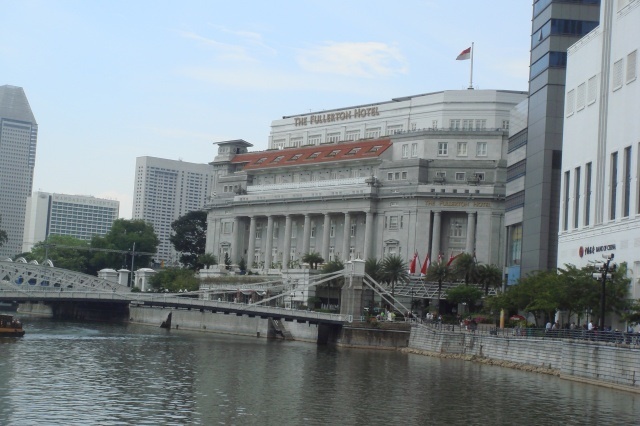 My wife earlier had wanted to visit Singapore’s botanical garden but on our way to our hotel The Marriott located on Orchard road, the main shopping district of Singapore. My wife said “Chris, there is no need to go to the botanical garden, the whole country is like a garden”. Even the strips of malls have lines of trees out front helping to shade you from the heat and humidity. Lucky I’m living in Japan and it’s Summer here and I’ve adjusted to the heat so Singapore’s weather was comfortable for me but to think that the temperature is like this 365 days of the year. Singapore known for its melting pot of ethnic groups and cultures with Chinese,Malay, Indian, Peranakan and European making up the country that their first language outside their home is English for business and education but until going there I thought it was like Hong Kong where most people can speak English but still use Chinese as their everyday language so when I first stepped into the glitzy malls along Orchard road I wasn’t expecting to hear everyone speaking English. 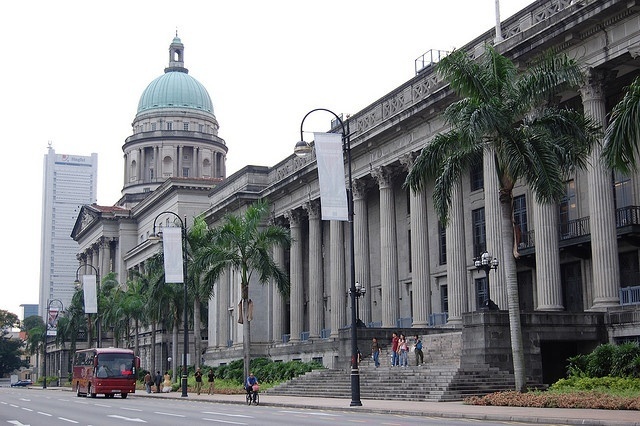 Singapore appears to have retained more intact buildings from their colonial era than Hong Kong, which mainly demolished them to build towering skyscrapers. Singapore on the other hand still studded with old terrace houses, river side warehouses, neo gothic churches and vast government buildings all built in the colonial style. That night as I laid in bed, the last thing I remember before falling to sleep was thinking Singapore is nothing like Hong Kong. Sentosa Island is where the locals and tourists go to play in Singapore. The island is only a 15 minute train ride from downtown. The island which was once known as Pulau Belakang Mati ‘ the Island After Death’ in Malay has over the years had so many facelifts to help it be resculptured and rebranded to become one big tourist attraction. It is hard to imagine what the island used to be like before the likes of a casino, a shopping mall, multiple resorts and a Universal Studio theme park took prime land on the island. Sentosa Island though can be quite expensive for a family as each attraction has a fee. 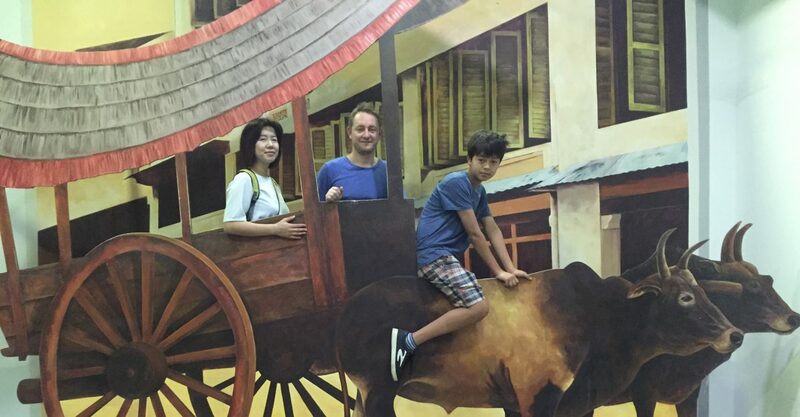 You can have fun at Sentosa or you can be taken for a ride. The attractions below are the ones that we recommend for the family. The latest main attraction to Sentosa Island is Universal Studios. An action packed movie theme park with attractions over seven zones. The park features attractions for the little ones in Far Far Awayland and Madagascar to the exhilarating rides for the older children in Ancient Egypt, as you plunge into total darkness on the indoor rollercoaster, The Revenge of the Mummies. In Sci Fi City, you will join transformers in the battle between Transformers and Decepticons in the fight against good and evil, on this thrilling 3D ride. There are enough shows to keep everyone entertained and ends with the nightly fire works display. 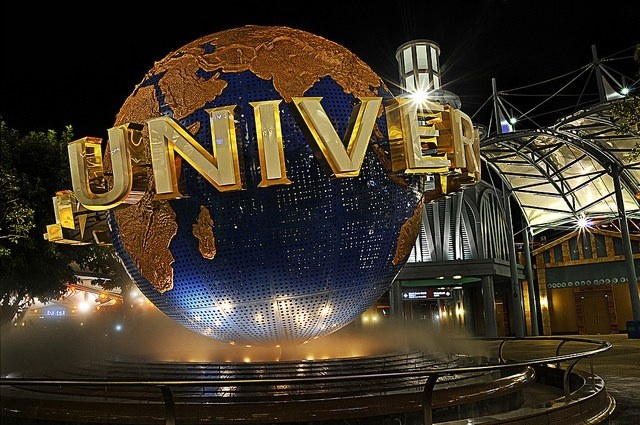 If you choose to go to Universal Studios then this will probably be the only place you will have time to visit on Sentosa Island, unless you choose to stay over night at one of the resorts on the island. 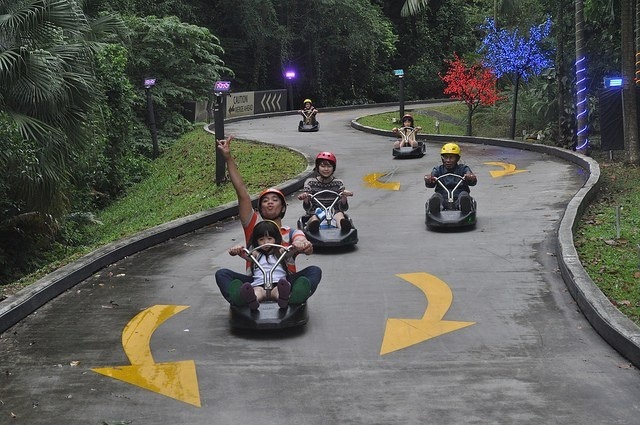 Sentosa skyline luge is part go-kart, part toboggan, steer yourself down the 650 metre track as it veers down the steep hill. If you’re after more excitement then try ‘The Dragon Trail’ with tighter curves. This track is 688 metres of fun. Riders are instructed how to control the luge before setting off. Fun for all the family the little ones can ride with parents while the older ones can drive by themselves. Unfortunately this is paired with the Skyride, which is a chairlift offering views of the surrounding area of Sentosa Island. Underwater World was the prize attraction on the island before Universal Studios came. It has more than 2500 marine animals. It starts with a hands on touch and feel exhibit, giving children the chance to touch aquatic sea life. 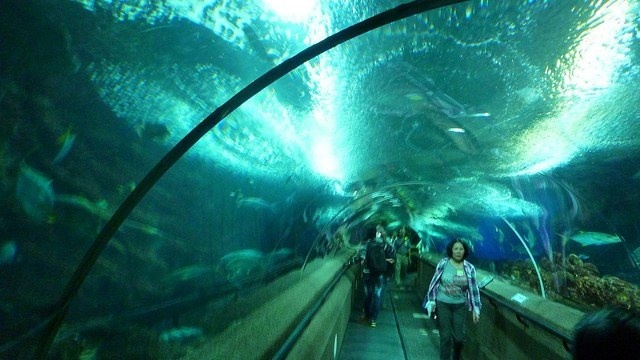 There is also an 83 metre tunnel which you can look at an array of marine life including coral reefs, sting rays, moray eels, turtles and sharks. Underwater world also gives you the opportunity to dive with sharks, dugongs or swim with dolphins. These programs come with an additional charge. 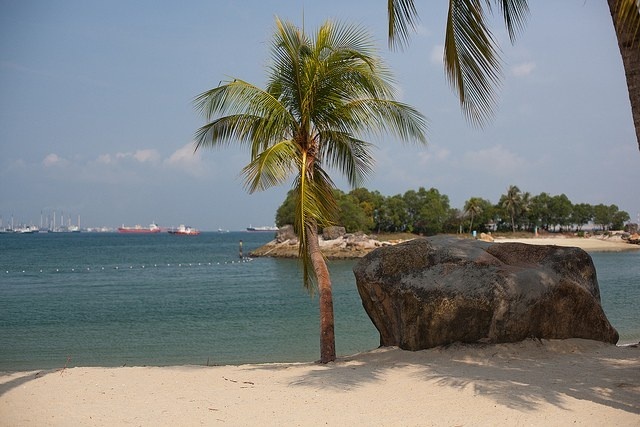 Sentosa Island has over 3 kilometres of beach with Palawan beach, Tanjong beach and the most well known Siloso beach. The white sandy beach is a perfect spot to laze around, play in the sand or play beach volleyball. The island has had sand shipped in from Australia to form the artificial beach. The water is not the cleanest due to ships, cargo carriers, oil rigs passing through the ocean, which you can see from the beach. The water is still swimable and a pleasant escape from the heat of Singapaore. 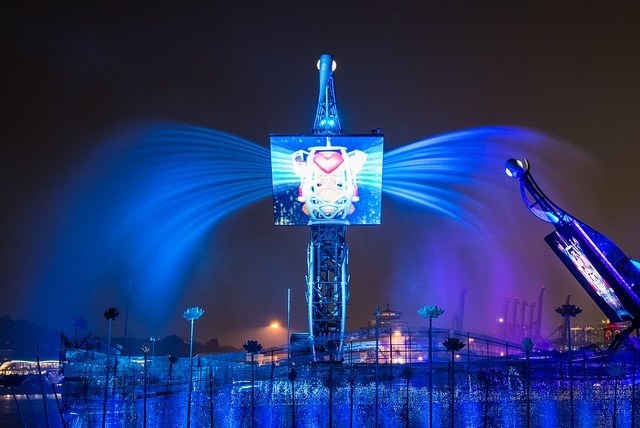 Sentosa Island has another light show but why pay money when you can see the love story between a pair of magical mechanical cranes and how their love for each other transforms them into real birds. Using visual technologies, astounding light and water affects be awed by the cranes graceful courtship ritual. Shows start at 9pm. Have you been to Sentosa Island ? What attractions would you recommend? Our readers would love to hear your experience. The Singapore flyer became the tallest Ferris Wheel in the world when it began operating in 2008. It stands 165 metres high, located near the Marina Bay Sands hotel complex. We had purchased our tickets online for the signature cocktail flight upon our arrival we were escorted to their complimentary flyer lounge for an exclusive check in, where we had the room to ourselves to relax, read, use of a computer and a refreshing drink while we waited for the capsule to be ready. Later, we were shown to our capsule as we passed the large queue of people waiting in line, I felt nervous as we passed everyone, knowing that they would be wondering why we were able to race to the front, we aren’t celebrities, we aren’t famous, we just thought this would be a good package for our family. The capsule has a 28 person capacity but because of our plan we had the whole capsule to ourselves. As we entered we were handed over our cocktails and Rei his mocktail. 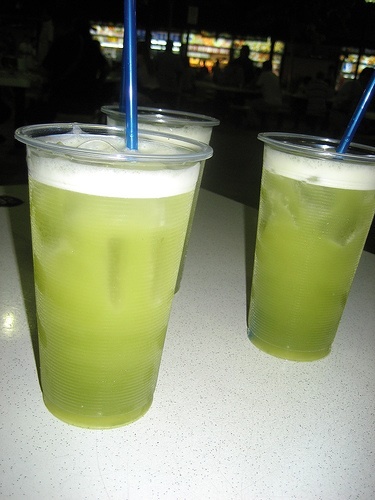 The drink was a concoction of whiskey, sour apple, lychee syrup, triple sec, caracao, lime juice topped off with soda. I wouldn’t rave about the drink but it was nice And quite strong. 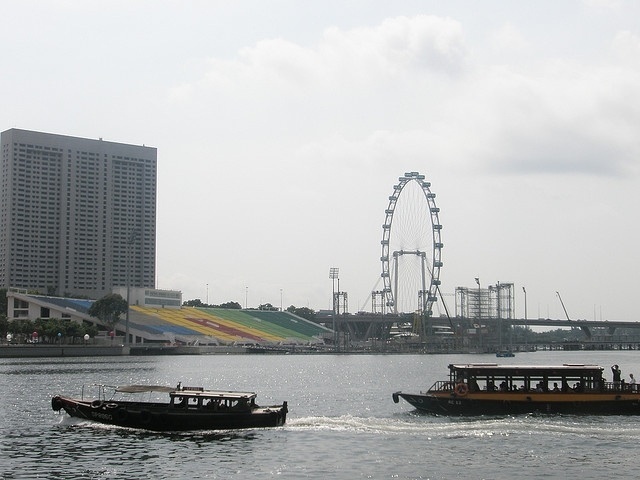 The Singapore flyer takes approximately 30 minutes to make a full revolution . The panorama views from the capsule captures the Marina Bay Skyline and on a clear day glimpses of Desaru in Malaysia and Bintan and Batan Island in Indonesia. The speed of the wheel is slow and after the initial excitement that lasts a few minutes, the view is kind of monotonous. 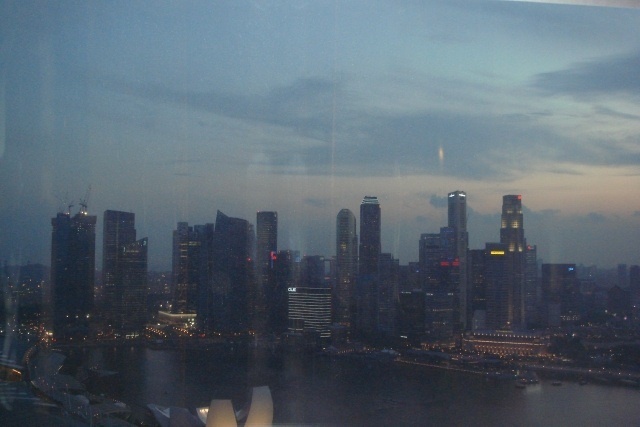 Singapore’s skyline doesn’t match up to the likes of London even though the Singapore Flyer is 30 metres taller than the London Eye. With alcohol and music blaring from the speakers with the likes of Katy Perry, Rihanna and Bruno Mars singing their lungs out, the rest of the time was spent dancing away with our night club moves. 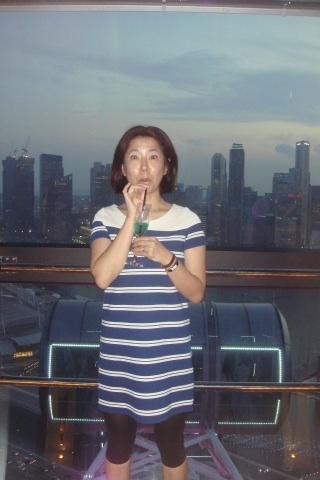 Since returning from Singapore we have read that the Singapore Flyer has gone into receivership. Details on why it went bankrupt are scarce but the fact is that observation wheels can find it difficult to survive on revenue alone. Even the most famous and arguably most successful wheel in the world, the London Eye, has had to depend heavily on sponsorship. Perhaps one reason why depending mainly on revenue to survive is difficult, which is what appears to be the case for Singapore Flyer, is because the novelty factor of a giant observation wheel wears out real fast. Of course, all tourist attractions experience that eventual loss of novelty. But it is harder to regenerate excitement and repeat visits for a wheel compared to other tourist attractions. A zoo or an amusement park can continually bring in new displays or new rides, construct new sections and expand, or even have an entire rehaul of the place. That can be tough to do for an attraction which consists of one main draw – a huge and heavy 42-storey-tall wheel. Another possible reason is just bad timing. Construction began shortly after its owners secured financing in 2005. 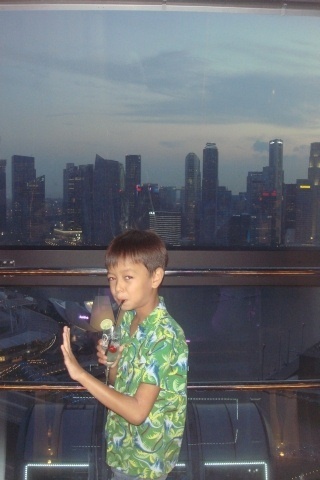 Just two years after the Flyer’s opening, Marina Bay Sands was up and running, offering a higher and arguably better view of Singapore, immediately dwarfing the Singapore Flyer and nudging it towards irrelevancy. 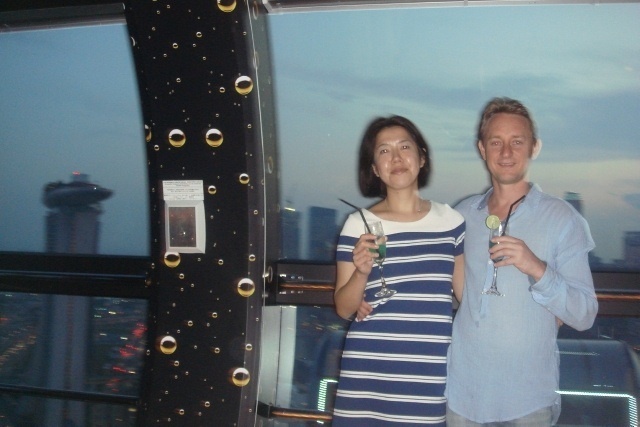 Have you been on the Singapore Flyer? What was your experience like? One of the first things you will notice when you are walking the streets of Singapore are their people. Singapore is made up of a diverse group of people. The country as of 2012 has 5.312 million people. 62% percent of these people are citizens while 38% of the people are permanent residents,foreign workers or students. 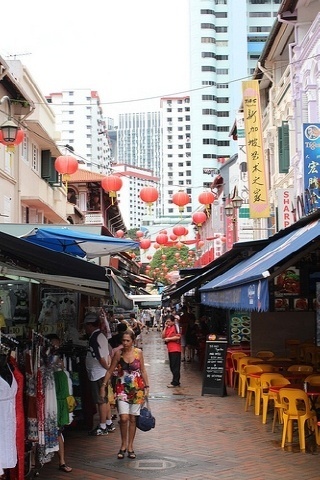 Chinese make up for 75% of the people, Malay 14% and Indians 9%.With such a diverse group of people, ethnic quarters have formed in Singapore with Chinatown, Little India, Arab street and Kampong Glam, the Malay town. Each quarter is worth visiting to see how these people live, their culture and what they sell in their shops. Chinatown, nearly every major city in the world has one. With their flashes of red signs and buildings to shrines and dragons to the kitche markets selling trinkets and other typical chinese souvenirs. Freshly cooked aromas of chinese food sizzle in woks, and dim sum sits in bamboo containers waiting for customers to order. Most Chinatowns are similar so why visit one especially in a country that is primarily Chinese like Singapore. Simple just like I mentioned above Chinatown’s in the world are so vibrant, they lure tourists and Singapore’s Chinatown is no exception. The area also known as Niu Che Shui in Chinese means “Bullock Cart water”. The first thing I recommend would be to soak in the festive ambience by having a meal at one of the brightly coloured shophouses that flank the streets of Chinatown. 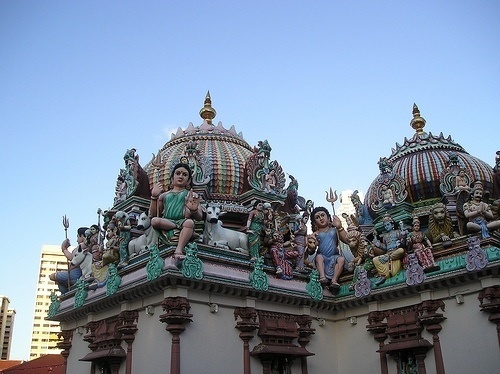 Afterwards wander down Pagoda street to Sri Mariaman temple, the oldest and most important Hindu temple in Singapore. Yes, that’s a Hindu temple in Chinatown. This is a very active temple, where Hindu’s come to worship. Make sure to take your shoes off and have a wander around to look at the intricately carved gopuram (statuary above the entrance). Don’t be scared to enter, we contemplated outside the entrance for 10 minutes before entering and no one said anything to us. Then spend the rest of the time strolling around the market. 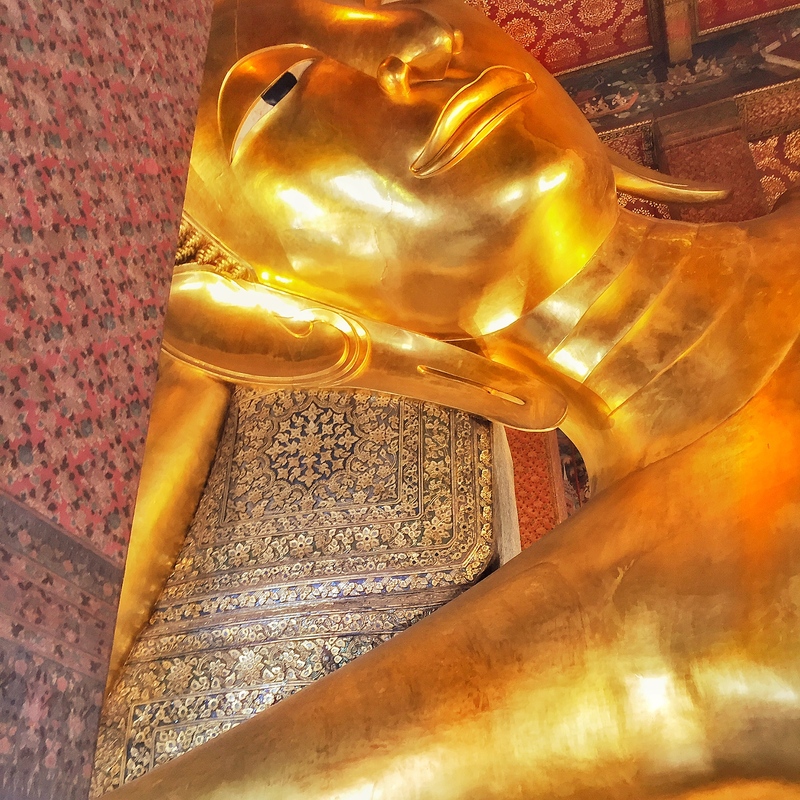 Other things that maybe of interest but we did not visit is the Buddha tooth temple, host to the Matreya Buddha and reputedly one of Buddha Shakyumuni’s tooth. To get a better understanding of Chinatown, it may also be worth visiting Chinatown’s heritage museum that brings Chinatown to life. Little India, bursts in a riot of colours from the jasmine garlands hanging in the stalls, shop fronts and buildings are painted in shades of yellow, green, light blue and reds. 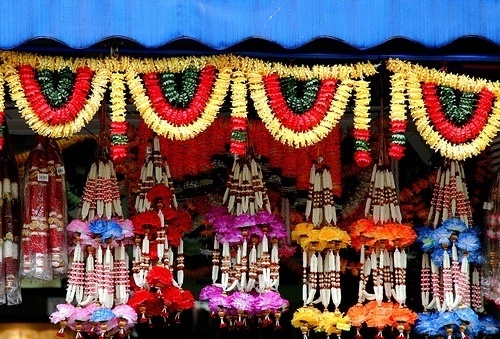 Indians stand in their little shop fronts selling insents, jasmine, spice and brightly coloured saris , traditional dress of India, Bollywood music plays. It feel like being in India itself, but of course much cleaner, with only a few Singaporeans traipsing the streets. 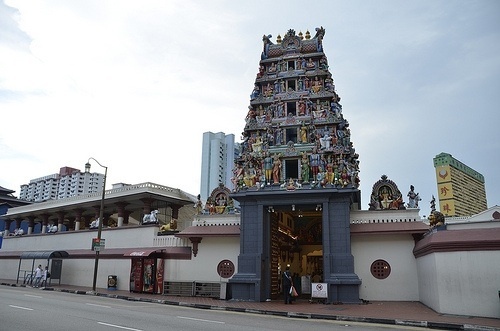 Little India is filled with restaurants serving authentic Indian food. 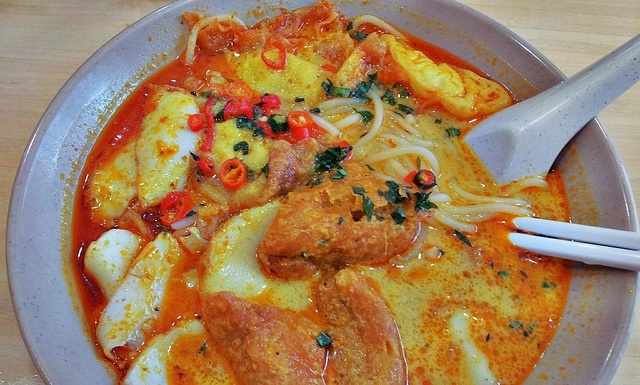 Apollo Banana leaf restaurant is famous for its fish head curry. Indians sit in small groups eating with their hands. Not only is the cutlery missing so too are the plates, who needs them when your food is served on a huge, green banana leaf. 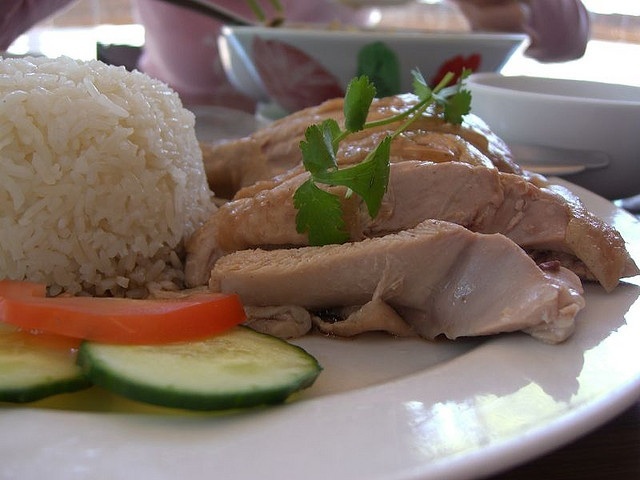 Eating at this restaurant is a dining experience. The fish head is gigantic with its big round eye , white teeth pointing out, the fish is soaked in a brown curry. You may feel apprehensive at first but once you try it you will find the fish breaks easily away from the bone. The fish is white and chunky. The curry has a perfect blend of spice. 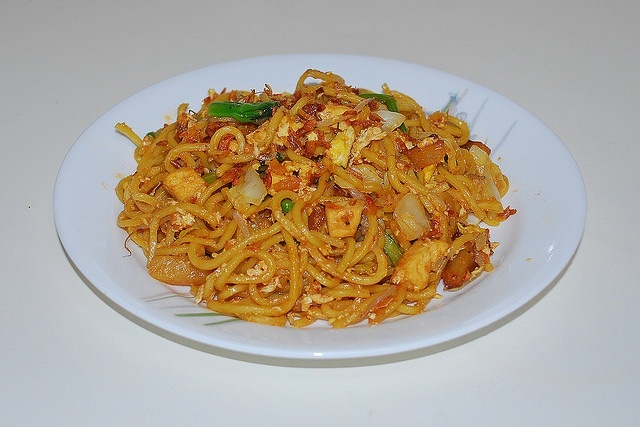 What is so great about Singapore is the food, a real foodies delight. 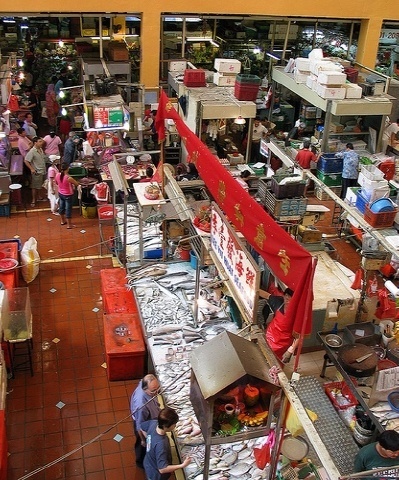 Tekka’s department store is known for its wet market. The market is an explosion of sights, smells and sounds. A real eye opener is seeing stingrays flopping around, turtles crawling over one another as well as a lot of other strange crustacean, shrimps, crabs and exotic fish. Of course most are alive and waiting to be sold to customers. Kampong Glam which gets its name from the gelam tree that grew in abundance in the area. In 1822 the area was officially allocated to the Malay and Muslim community. Singapore’s most important mosque, The Majid Sultan is found here. The present mosque was built in 1928 and features carpets that were donated by a　prince of Saudia Arabia. You are able to enter the mosque if you are not dressed appropriately, there are cloaks available for free. Arab street is where you will find bales of silk, batik, lace, organza. It is where you come for carpets, antiques and rattan handicraft to spruce up your homes. Singapore may lack major attractions but its through its people, its ethnic quarters that make this country come alive. A place you can come and learn what its like to be part of this country.